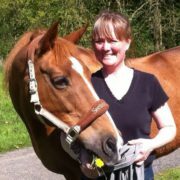 Certified Equus and Life Coach Kat Fallström guides amazing men and women on their path to powerful self-discovery and deep connection with themselves, their lives, and their 4-legged friends. Kat offers private sessions via Skype, and in person at a stable near Amsterdam, she is also happy to travel to meet you. Kat grew up in Finland and lives in Holland. She coaches in English, Dutch, and Finnish. Kat has a Master’s degree in Business Administration, made a career in Procurement – one day she was a VP negotiating outsourcing contracts, and the next an Equus Coach. She now knows that you don’t have to drop everything and run to change your life. Just put yourself at the Heart of Your Life and keep your career, pets, house, and spouse! Learn the art of having your cake and eating it too!